East York Basketball – EY Bantam Boys Win Bronze Medal! EY Bantam Boys Win Bronze Medal! 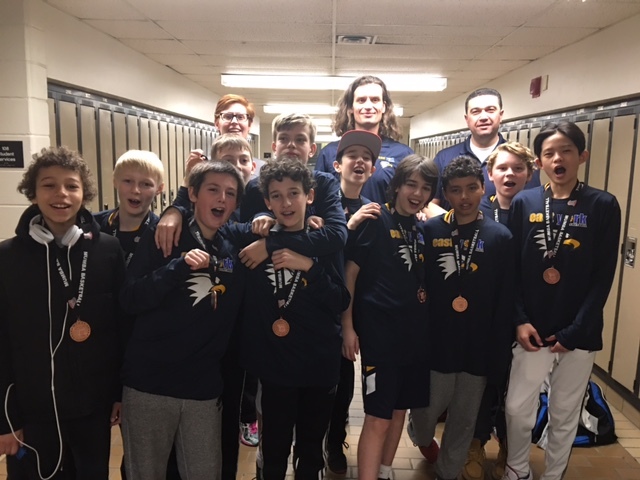 The East York Bantam Boys U13 team played at the MUMBA tournament over the weekend of April 8-9, 2017 in preparation for their provincial finals (April 21-23, 2017) and came away with a Bronze Medal for their efforts! The squad used the tournament as an opportunity to practice and fine tune their play, but also to allow all players as much time on the court as possible in celebration of a long season. In the first game the team faced a familiar foe, Toronto Lords, for the fifth time. Having won all four of the previous meetings EY was ready for a motivated and much improved Lords team, but played a strong team game on both offense and defense to take the win with a score of 55-42. In the second game the rotation for the team changed quite a bit and the boys faces a formidable home team, MUMBA Gbas. This game was a good reminder that a consistent effort on both sides of the ball for four quarters is necessary to secure a win and the boys were somewhat humbled to take a loss 66-36. However, the team regrouped for a third game on Saturday against a determined Motion Basketball Bantam team. This was as scrappy as game as one will ever find and it was good to come out on top in what can be characterized as an “ugly” win by as score of 34-31. In that game, having taken a 18-6 lead after the first quarter, EY let their advantage slip away and trailed 28-27 late in the fourth only to show resolve and come away with the win. In the fourth game of the tournament on Sunday morning the team faced another local squad, MUMBA Shariff. Having gone two for two in previous games against this team, with the first game coming down to the wire in a 57-55 victory for EY, the boys played consistently for all four quarters and were not rattled by any mishaps to take a solid 75-50 win and the Bronze Medal overall. Congratulations to all and good luck in Milton at the Provincial Cup! By eastyork|2017-04-10T10:05:04-04:00April 10th, 2017|Bantam Boys, Rep Teams|Comments Off on EY Bantam Boys Win Bronze Medal!